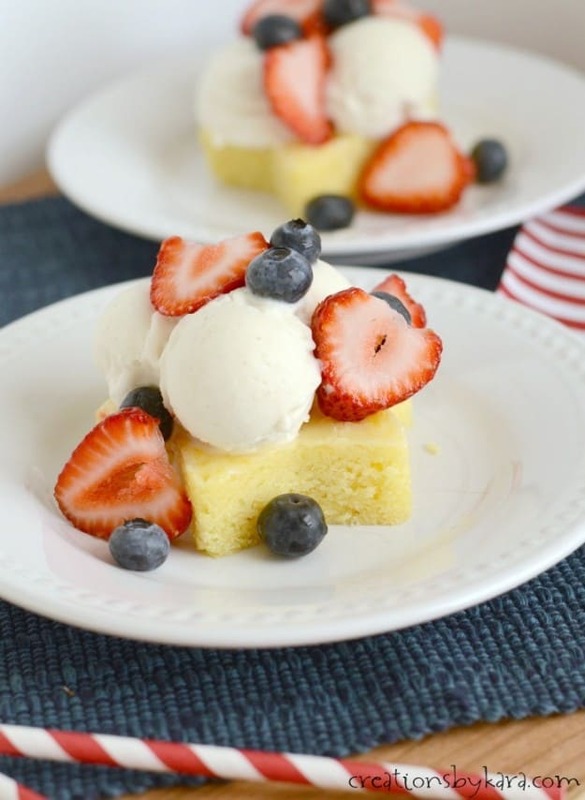 Looking for awesome 4th of July recipes and ideas? You’ve come to the right place! 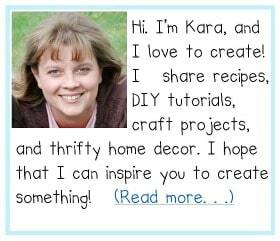 I’ve teamed up with some awesome bloggers to bring you dozens of Red, White, and Blue recipes and crafts. 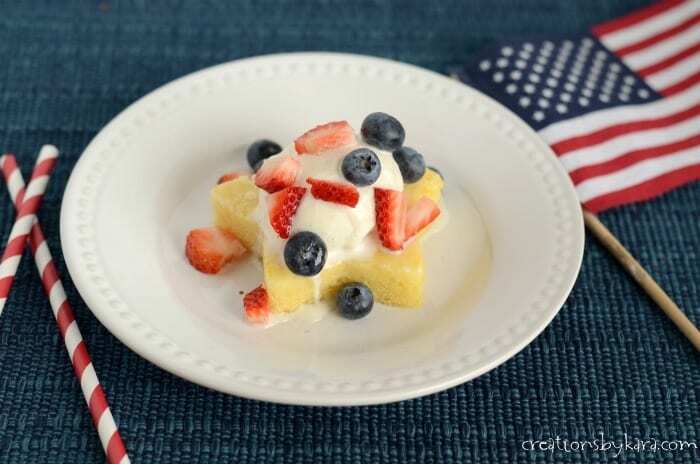 I’m sharing a recipe for Lemon Berry 4th of July Dessert, and it is the perfect summer dessert! One of the things I love most about summer is the abundance of fresh berries. Man they are good! They are also the perfect color for 4th of July desserts, so I try to incorporate them every year. This time around I paired them with some delicious lemon bars. They are not the traditional lemon bars with the shortbread crust. They are more like brownies, but lemon flavored. So good! 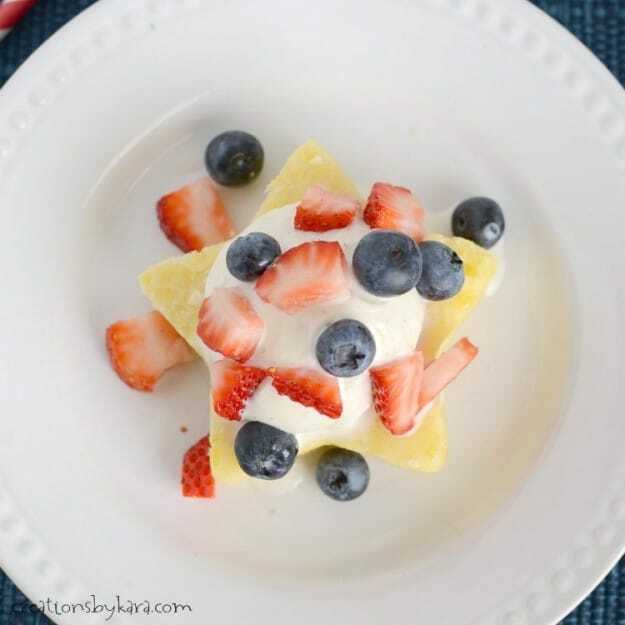 In my opinion, they are better than lemon bars!The lemon and the berries go just perfectly together. 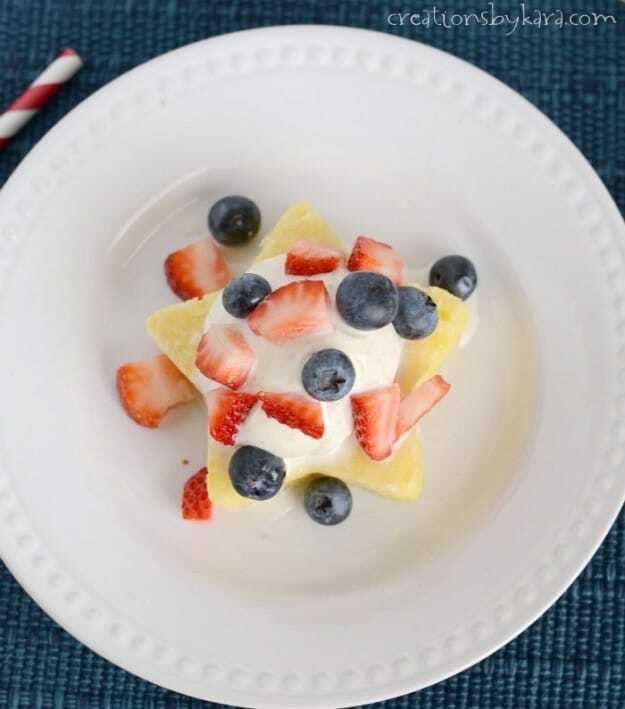 Add a scoop of vanilla ice cream, and you have a delightful summer treat! You can just cut the lemon brownies into squares, but I used a star shaped cookie cutter to cut them out. So festive, and so pretty for the Fourth of July! See how fun they are with the cute star shaped bars? Your guests will love them! Cream butter and sugar in a large mixing bowl till creamy. Beat in lemon zest, lemon juice, and eggs. Line a 9×13″ pan with foil, leaving at least 3 inches of extra foil at each end. (This will help with removing the brownies later.) Spray the foil with non-stick cooking spray. Spread the batter evenly in the foil lined pan. Bake at 350° for 30-35 minutes or till edges are starting to lightly brown and middle is set. Cool in pan for about 20 minutes, then use foil to carefully remove brownies to a cooling rack. Cut into star shapes with a cookie cutter. 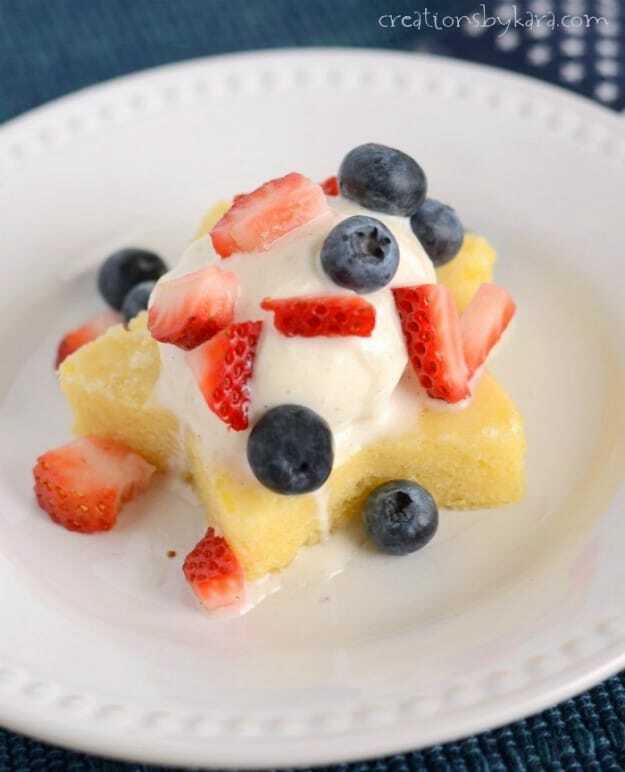 Serve with vanilla ice cream and fresh berries. If you prefer, you can just cut the lemon brownies into squares instead of star shapes. 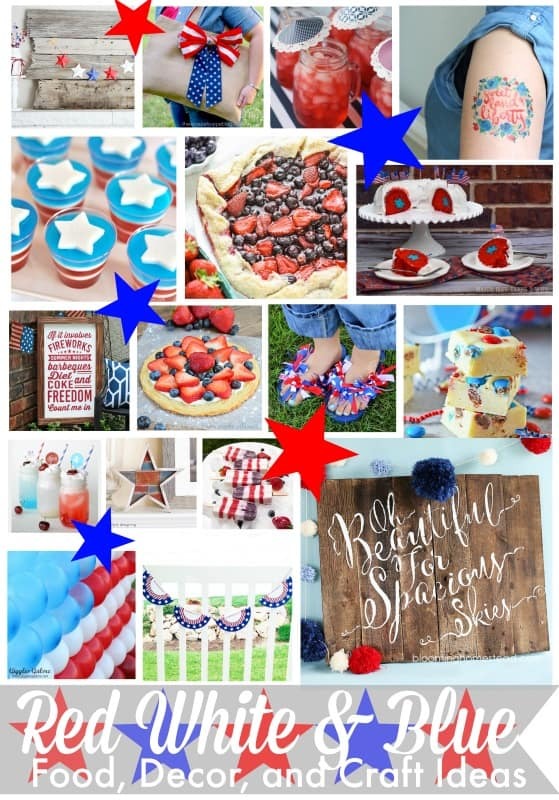 Here are dozens more Red, White, and Blue recipes, crafts, and party ideas. Enjoy! !